Have you been out on San Diego’s trails lately? You may have seen me out there, too . . . hard at work on the 3rd edition of my book, 60 Hikes Within 60 Miles: San Diego (and enjoying every moment). 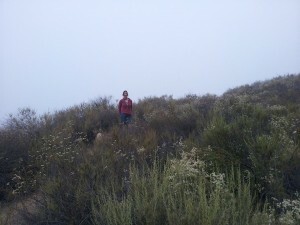 This picture was taken at one of the new San Diego hikes that will be included in the new edition. Do you recognize the place? If so, let me know. The first person to guess correctly gets a free copy when the new edition comes out – – this offer excludes anybody who was with me that day! Join San Diego hikes on facebook.